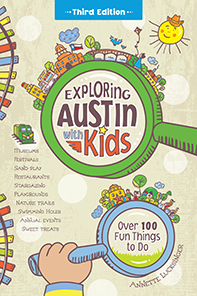 Exploring Austin with Kids News - Mark Your Calendar for Juggle Fest - Saturday! One thing about working on a guidebook is that you can’t put off trying things on the “to do” list. You’ve got to do them now, especially annual events since they don't come around often. Juggle Fest was on my “check it out someday” list. I had heard buzz about it. It’s in my Austin Events calendar. So I grabbed my family troupe and we went to check it out. I haven't missed a year since! Organized by the Texas Juggling Society, a UT student group, it’s three days of workshops on the art of juggling, filled with games, races, and prizes. It’s open to jugglers of all levels, and spectators too. But for you non-juggling types like myself, the group organizes a Public Show on Saturday evening that is just plain fun! 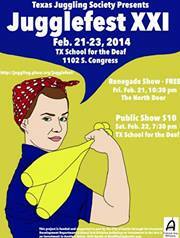 Held in the old-style auditorium of the Texas School for the Deaf, all ages flock to watch local and international acts perform silly, zany acts - from unicyclists and jugglers to choreographed hula hooping and circus arts. I was amazed by the talent, and it was fun to sit in a crowd of giggling kids and cheering college students. Where those two crowds intersect, you know you’ve hit on something that creates a wonder and excitement that is never outgrown. If you miss the old Austin that everyone laments is fading, the “weird” that is harder to find these days, and the homegrown, community feel to events, mark your calendar for Juggle Fest!